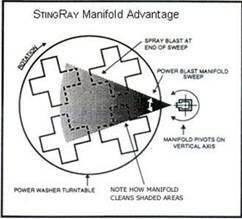 The StingRay industrial Parts Washer with the Power Blast Manifold is a superior cleaning mechanism. A manifold is the part of the machine where the spray nozzles are mounted and the manifold's function is to distribute the large volume of cleaning solution to each nozzle evenly. Compared to the fixed spray manifolds used in the majority of other parts cleaning systems, the power blast manifold and non-synchronous turntable rotation is a better cleaning method. The StingRay Power Wash process outperforms all other parts washing systems with shorter cleaning cycles and yields cleaner parts. A critical factor used in the StingRay washer is the oscillating solution delivery system (Power Blast Manifold) that is non-synchronous to the rotation of the turntable. This oscillating manifold assures that the blasted solution reaches all areas of a wash load that are otherwise blinded to stationary manifolds used in jet spray washers. The oscillating manifold sweeps back and forth through a 40 degree arc penetrating the wash load at many angles. Each time the rotating turntable load passes the manifold nozzles, it is blasted at a new angle. These multiple angles of attack, clean all areas of the wash load. Deep cleaning of the wash load is accomplished with internal areas coming clean just like outside surfaces. Overall, the oscillating manifold system of a StingRay far exceeds the cleaning capability of a fixed spray angle yielding faster more thorough parts cleaning cycles. All StingRay Parts Washers utilize the Power Blast Manifold (PBM). The nozzles in most industrial parts washers are fixed and aim at one spot on the turntable. Throughout a wash cycle the spray strikes the surface of the wash load at a single angle. By comparison, at the heart of every StingRay Parts Washer lies the patented, non-synchronized, oscillating spray manifold system that blasts parts from a different angle each time the part passes on the rotating turntable, providing thousands of strike angles during each wash cycle. To fully appreciate the moving solution blasting mechanism in a StingRay Parts Washer, imagine cleaning a basket of randomly loaded parts with a water hose fitted with a regular garden spray nozzle. The basket slowly rotates on the turntable in front of you. To simulate the cleaning action of most industrial parts washers, stand still and do not move, aiming your nozzle at one spot on the wash load while it rotates. Let the basket rotate for many revolutions without moving your spray nozzle. How did the basket clean? Not very well. There are many areas that did not come clean while others that were directly in the path of your spray did come clean. No one would clean a basket of parts like this and yet this is the design thinking in the majority of parts washers on the market. Now imagine another another basket of dirty parts on your turntable and start it rotating. As the table rotates, move your spray nozzle back and forth and up and down to cover all areas of the wash load. For difficult soils and hard to reach areas adjust your spray nozzle to narrow the spray angle for maximum cleaning force in a small concentrated blast area. These two actions represent the design thinking in a StingRay parts washer. The StingRay oscillating moving manifold system acts like your arm moving back and forth, generating multiple angles of attack on the wash load. The adjustment of the spray angle to a narrow high impact jet is the type of spray pattern a StingRay washer uses for each of its wash nozzles. To cover the entire work load multiple nozzles are used that blast across horizontally, from the bottom up, and from the top down. StingRay spray pattern angles and the spray manifold are carefully design to prevent nozzle spray from interfering with other nozzles in the system. Intersecting spray collides and wastes a majority of the hydraulic energy in the moving water, falling harmlessly to the washer floor. StingRay non-intersecting spray patterns deliver all their energy to the wash load thereby maximizing cleaning ability from the wash machine pumping system. How does Power Density affect the cleaning results in a parts washer? What is so special about the Power Wash Process for cleaning parts?